The Roominators Alpha-DST acoustic sound control kit provides all the components necessary for superior acoustic performance. Suitable for spaces smaller than 100 ft2, the kit helps control reflected sound for more accurate recording, monitoring and mixing. Whether it's the home studio, a home theater, a Pro Tools suite, the Alpha-DST kit is designed to dramatically improve the acoustics and provide a designer look. The kit contains thirty-two Charcoal Grey DST-112 panels, thirty-two Purple DST-114 panels, four Charcoal Grey DST-LENRD bass traps, and includes enough EZ Stick Pro Adhesive Tabs to mount the entire kit. Box Dimensions (LxWxH) 33.0 x 25.0 x 25.0"
Alpha-DST (Charcoal Gray/Purple) Roominators Kit is rated 4.0 out of 5 by 2. 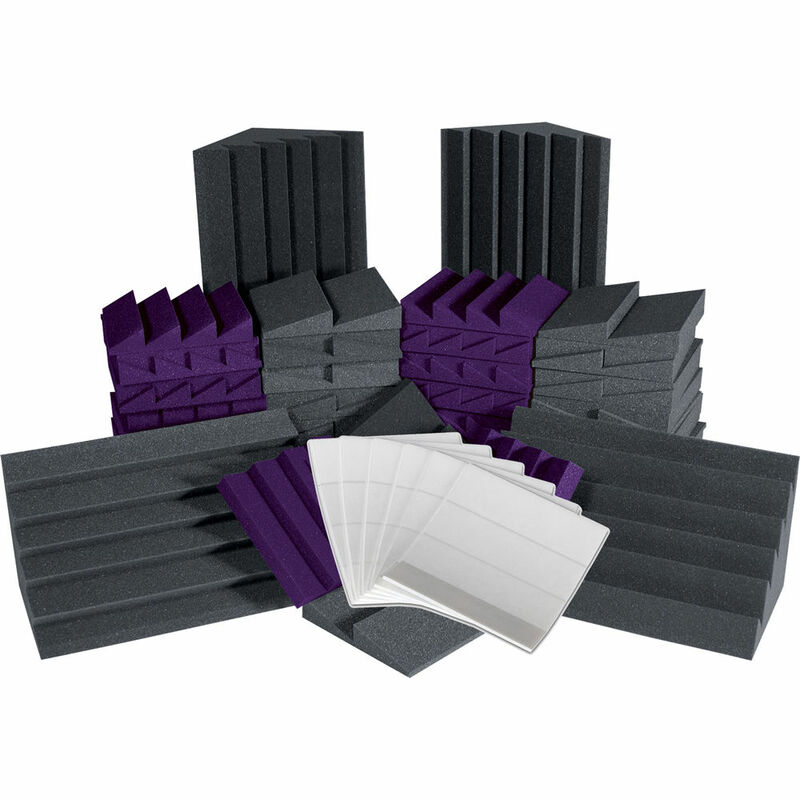 Rated 4 out of 5 by vicenzajay from Plenty of panels in this kit Auralex foam is reasonably well known at this point - there are better, more expensive options for room treatment (GIK, Realtraps, etc. ); however, these panels do a nice job of filling in the cracks.Only negative is that these ship with TubeTAC instead of FoamTAC. TubeTAC is for permanent installations while the FoamTAC allows for semi-permanent installations letting you move panels and take your gear with you if you have to relocate. Note that installation simply uses small double-sided, adhesive foam tape strips. If you are installing in a long-term space, these are great and hold well; however, they are extremely hard to remove should you decide to relocate the foam. This took no longer than an hour for me as I had already sketched out where to place them in my studio.